Reel Fling Ceilidh band with caller and disco for weddings and private functions in Glasgow, Edinburgh and throughout Scotland. 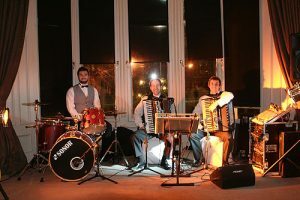 This is an upbeat energetic professional three- piece ceilidh band that offers an entire evening of fun filled entertainment. The Reel Fling - 3 piece Band caters for all occasions from Birthdays to Graduation balls and fundraisers. The band has played with distinction in a variety of venues all over Scotland including Cameron House, the Crowne Plaza, Mount Stuart -Rothesay, Edinburgh Corn Exchange, The Sheraton Grand, Hilton Glasgow ,Marriott Hotel, Radisson Blu, Doubletree Hilton Dunblane Doubletree Hilton Glasgow City, Faslane Naval Base, Trump Turnberry, House for an art Lover, Lodge on Loch Lomond and many more The bands normal line up consists of two accordions and drummer that give the band a wide range of sounds including bass and piano and to keep you in step they call the dances with a dance caller who will talk you and your guests through each dance. Incorporated into the evening is a disco section made up from your own playlist or from our own wide selection of songs. They provide all sound and lighting equipment and can cater for most sizes of Function room. All equipment is Portable Appliance Tested (PAT). Every function is tailored to your needs and we are confident that you and your guests will have an enjoyable and memorable night.